By now it’s not hidden from anyone that Tata Nano is by far the cheapest car in the world. Yes it is and very soon will be ‘was’ the cheapest car. Yes you heard me right. Not that Tata Nano will suddenly become an ostentious fool but rather Tata with a joint partnership of Titan Gold will launch the new variant of Tata Nano that will literally bath in gold. Don’t believe me, then just wait for a couple of months and see for yourself. This variant of Tata Nano is christened as Gold Plus Tata Nano. 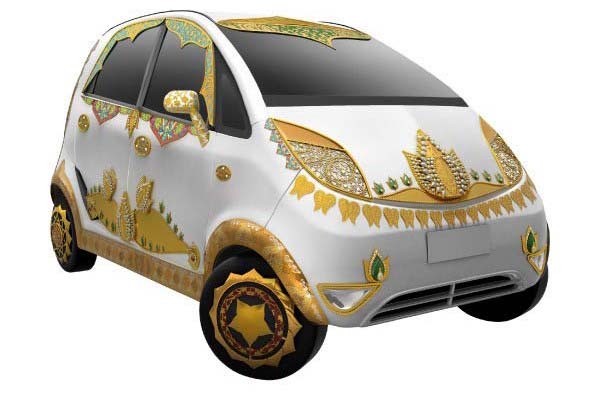 This Gold Plus Tata Nano will be India’s first jewellery car. This car will be manufactured in the Hosnur manufacturing unit and the gold work on this car will be taken care by the Gold Plus company, a subsidiary of Titan Company. Now you might be wondering why Titan seems to be interested in the automobile industry. The reason being, that Titan wants to celebrate the 5000 years of Indian jewellery. There will be only a single unit of the pure gold jewellery car. This car will be manufactured as the symbol of the Titan COO’s dedication and constant precision. If you’ve started dreaming lately about this car then let leave that thought in peace because this car will not be offered for sale. This car will only serve as a ‘memento’. The selection of the design over this car was a tough task. There were some 120 odd designs which have been offered for the public voting. The results of this voting will be announced by the mid January and obviously the one design which will bag the maximum votes will be selected. This car will be on display by the April 2011 and no doubt this ‘Tata Nano’ will be the one gold standard of a car that the world will actually drool for.